Advanced Heads Up Mastery Review - are you ready to crush poker? 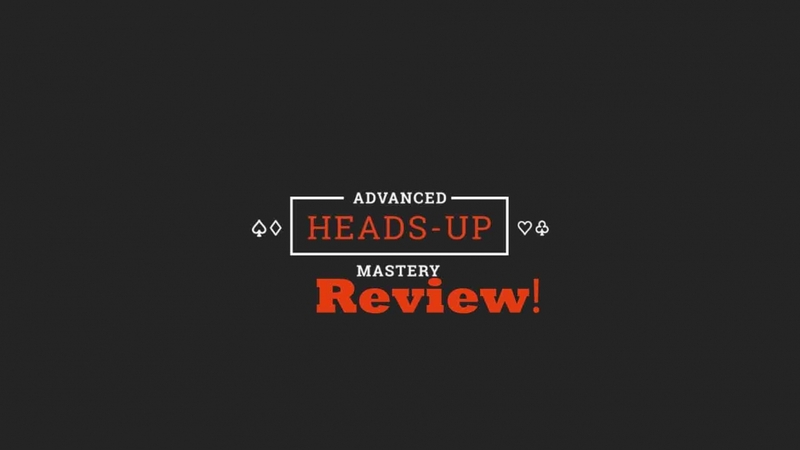 Advanced Heads Up Mastery Strategy Review – are you ready? Of all the different ways to play poker, most players tend to agree that heads up is the one segment where the skill is emphasized the most, especially in deep-stacked HU cash games. The heads-up game is less about cards you’re dealt and much more about how you play those cards and how you adjust to your opponents’ tendencies and style of play. Moreover, in all Texas Holdem formats, you will end up playing most of your hands heads-up, thus leaving yourself vulnerable in this spot is like shooting yourself in the foot – there is no way to be a winning poker player without mastering heads up poker strategy. These things also make heads up probably the hardest segment of the game to truly master, making it a real challenge. However, for those ready to put in the required work and really apply themselves to studying, the Advanced Heads-up Mastery course available at Upswing Poker offers everything you could possibly need to succeed – and more. 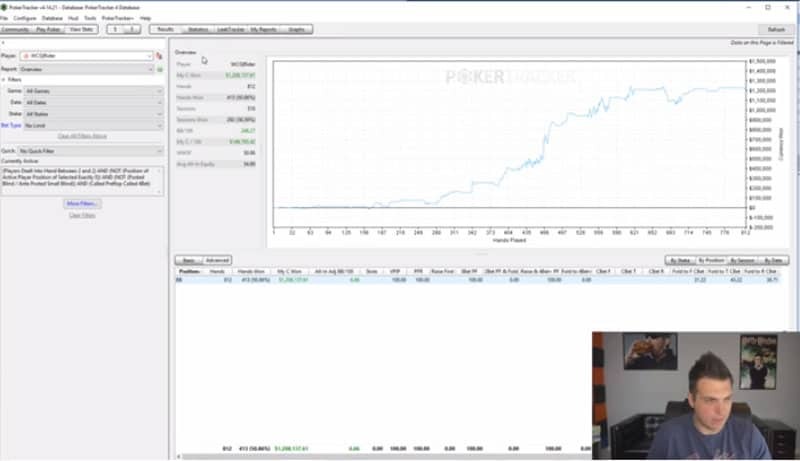 The extension of The Lab(complete Upswing poker lab review) caught by Doug Polk himself, the course provides a detailed breakdown of HU poker, going into (sometimes painful) detail on how to approach the HU play and what is required to make it in the competitive environment of today’s game. As far as credentials are concerned, Polk has been one of the most successful nosebleeds heads-up players for years, battling it out with the likes of Sauce123 and Jungleman, and coming out on top. An important thing to understand going into the Heads-up Master course, however, is that there is no magic formula for becoming a HU master overnight. Although Polk offers all you’ll need to succeed, a lot of it will still depend on your willingness to put in the hours and work on your game, applying the newly acquired knowledge and bringing it to the table. So if you considering what you can find inside, let me review this course so that you could make your decision! The introductory video prepares players for what’s ahead of them, which is well over 20 hours of intense poker lessons. 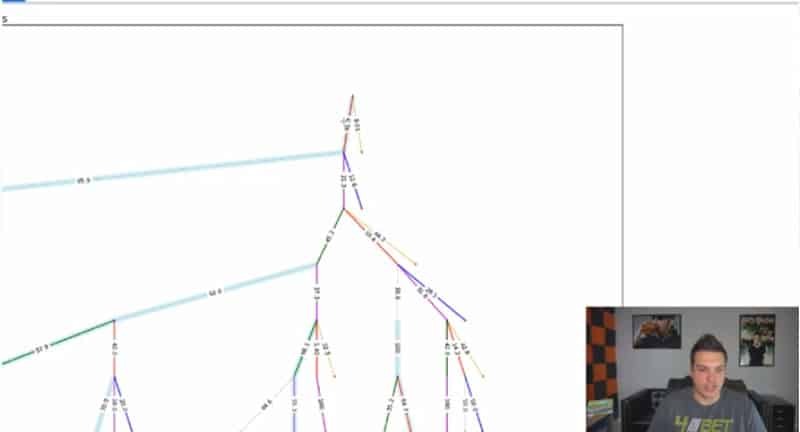 Polk tries to briefly break down the course, explaining things that will be covered in the vides to come: creating and assigning ranges, a breakdown of combos, and examples of hands, both staged and actual ones from his own database. From the getgo, Doug emphasizes the importance of the hands-on approach to really make most out of this course, i.e. going through your own database of hands with these new concepts and ideas in mind and analyzing your play. Although the course is one of the longest, if not the longest available on Upswing, it isn’t nearly enough to cover all the intricacies of heads up play. Polk also introduces the game-tree idea, the one which he’s been successfully applying to his own game and which has helped him become the player he is today. Over the duration of the course, Polk often refers to different game-trees to analyze certain spots in the game, so it is definitely a good idea to listen to the introduction and understand where he is coming from and what type of analysis to expect moving ahead. 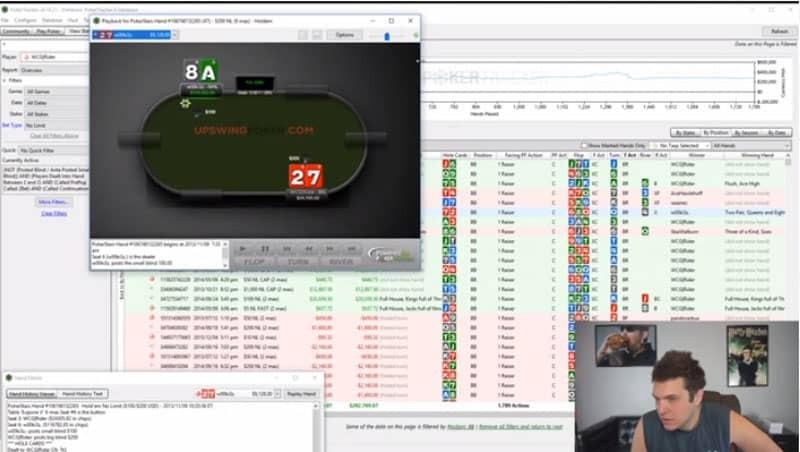 The course begins with the series of videos covering the preflop play. Right at the onset, Polk emphasizes that this particular part will not be the focus of the course because postflop play is much more important in heads up. Despite the fact, the preflop play section is still rather extensive and covers a wide array of situations. The segment begins with several videos devoted to small blind play. Polk begins with presenting a case against limping. Although limping instead of raising when in the small blind can be an effective strategy in short stack games such as Spin and Go, in deeper games, it can be too complex to implement, because it requires you to have a perfect balance between strong and weak hands. So, instead of trying to tackle the particular subject, he dismisses it for the purposes of this course and continues with the raise approach (RFI). As expected, videos heavily focus on the topic of raise sizing and how to come up with good numbers based on your perceived equity, your opponents’ tendencies, etc. Doug suggests varying your raise size based on your opponent and also changing your range accordingly. In general, sizes discussed in the videos go anywhere from 2.2 to 3 times the blind, while min-raise is pretty much dismissed as a legitimate strategy in today’s games, where you’ll lose a lot of your fold equity by min-raising. The theoretical discussion is accompanied by some concrete examples from his own database, where he finds different hands to explain the concepts and get his ideas across. The segment covering the big blind play is somewhat more extensive, including five videos overall. Polk never fails to mention how playing from the big blind will always be tricky because we’re bound to lose some equity by being out of position and we need to compensate for this using various strategies that he proceeds to present. The first aspect covered in this particular segment is the play in limped pots, i.e. when the small blind decides to complete instead of raising. In general, Polk always advocates for a more aggressive approach to these spots because aggression can be a good way to overcome the positional disadvantage. The idea is to often raise when faced with a limp and use a size that will deny your opponent equity and put them in a lot of tough spots. Of course, all of this is accompanied by solid math, percentages, and in-depth explanations that back this theory and prove that it actually works. Polk first begins by breaking things down by three most common raise sizes, i.e. 2x, 2.5x, and 3x. He explains how he was among the first players to really expand his BB defend ranges, which was one of the reasons for his overall success in heads up. There is nothing wrong with having a very wide defend range against min-raises; in fact, the math supports this approach. As raises get bigger, you need to adjust your BB range accordingly. Although you’ll have a certain range for different types of opens, it is always imperative to make small tweaks as you go along and adjust to the particular opponent, with the goal of playing as many hands as you can profitably. For less-experienced HU players, the range of hands Polk suggests as suitable defends or 3-bets can be somewhat surprising because it is very wide. Once again, this refers back to the idea of playing as many hands as you can, as long as numbers support it and you can do it profitably. 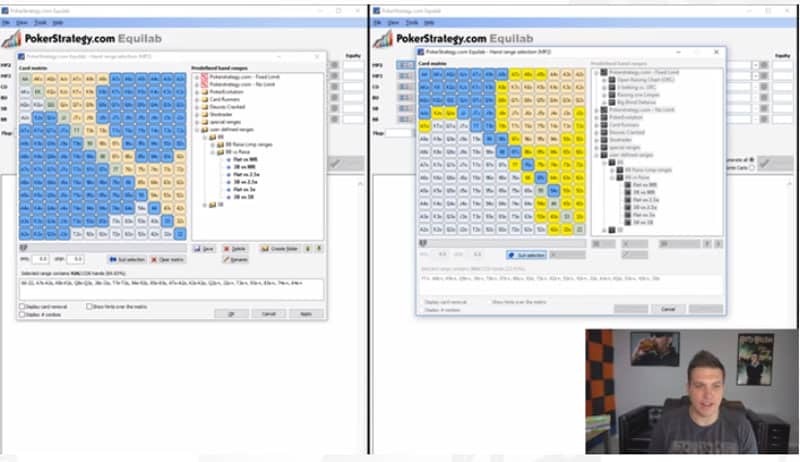 Polk then proceeds to explain the math behind various 3-bet spots through some examples. 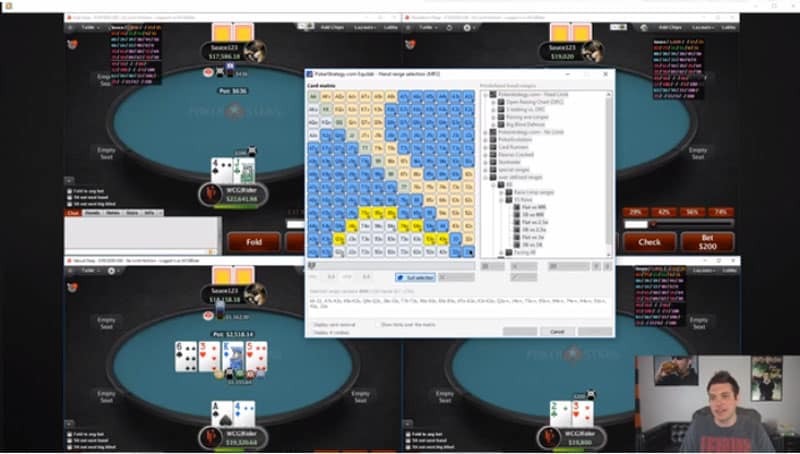 One interesting hand dissected in the video is playing 56s and its playability as 3-bet against differently sized opens. Once again, he goes back to talk about the inherent disadvantage of being out of position but emphasizes how taking over the initiative will help compensate for this disadvantage a lot. This segment also wraps up with some actual examples from the database, looking at various interesting spots and how they actually work out against real, high-level opponents. Additionally, all math discussed in this part of the course is available for download so you can always have it handy. After covering the usual preflop spots, the course moves on to look at 3-bet and 4-bet pots and how to approach these situations before the flop. Of course, this is an important segment of play, although 4-bets aren’t as complex as these ranges are usually quite heavy on the value side. The first thing covered is playing from the small blind when faced with a 3-bet. Polk discusses some general concepts and how certain hands are much better suited to be included in your calling range instead of 4-betting. In general, hands that can call profitably aren’t great 4-bet hands. He also emphasizes that there isn’t too much reason to slow-play your big pairs in today’s games and while you can occasionally mix things up by just calling with Aces or Kings, other big pockets like Queens, Jacks, and Tens, should be 4-bet pretty much 100% of the time. In terms of 4-bet bluffs, Polk suggests you should spread them over more hands instead of just picking one hand (like A5s) to always use as 4-bet. This protects your perceived range and makes it harder for your opponents to play against you and also helps you make sure you aren’t going crazy with 4-bets. Once again, your ranges shouldn’t be set in stone and should change depending on the opponent you’re playing; i.e. some hands that are just a call against tight players can make good value 4-bets against looser opponents (like AQ, pocket 9s, etc.). When playing from the big blind and facing a 4-bet, things can become a bit trickier. Doug explains how it is pretty much impossible to give exact default ranges here and this particular segment of the game has much more to do with how your opponent plays, what his general tendencies are, how often he 3-bets, etc. Although framework ranges are provided, in general, it is important to stay aware of your opponent and make sure you adjust, because there are, for example, players you don’t want to jam on with your pocket Aces if they fold way too often in these spots. Another big thing to look at in these spots is the sizing used by your opponent. If their 4-bets are on the bigger side, this lets you get away with many more folds profitably. Against smaller sizes, you’ll have to take the flop with some of your suited hands to try and hit and proceed from there. After the section on the preflop play, the course moves on to a more comprehensive postflop play section. As announced in the introduction, the course focuses more on the play after the flop as it is more significant and also more complex than the preflop part. The first couple of videos give a rundown of important aspects that will be covered in the lessons to come, also explaining Polk’s poker background and the way he came up with the strategies that will be presented. 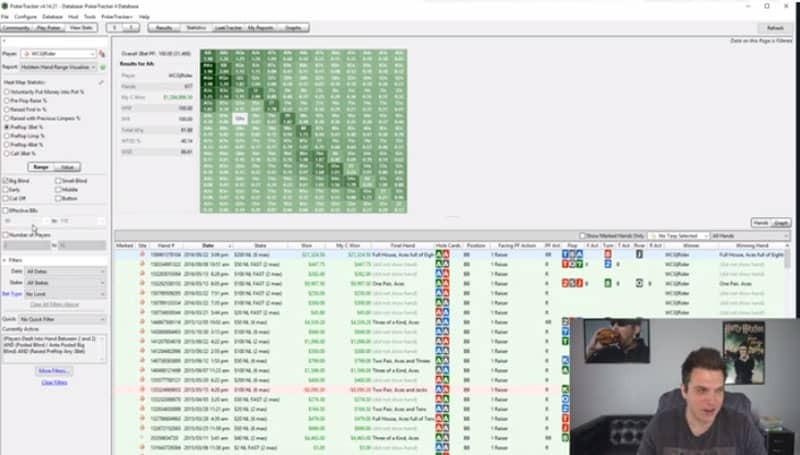 This is where he explains a bit more about the whole game-tree concept, how he came to think in this particular way and how it helped him understand the way in which heads up poker should actually be played, trying to always stay on top of your game across all various segments of the tree. The second video in the introductory part deals with some general concepts, especially the overall importance of aggression and barreling with high frequency. He explains two major approaches used in modern games, emphasizing the one where our flop c-bet frequency is somewhat lower but with increased aggression on various turns and rivers. He prefers this particular approach to the one that features a higher flop c-bet percentage because it provides you with an opportunity to put your opponents’ in tough spots and deny them a chance to float you with their non-equity hands, knowing they’ll have to deal with aggression on later streets as well. Of course, a balanced approach is required here as well, because we don’t want to get to the point where other players can turn tables on us and simply trap us with their strong hands, folding the rest. 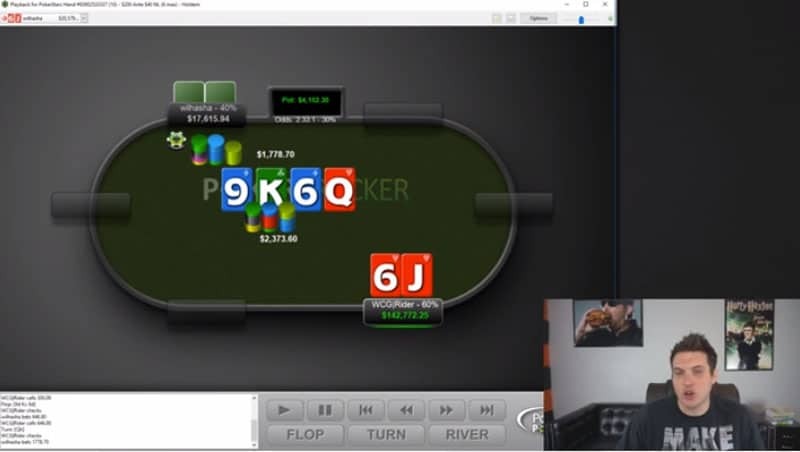 The first segment of the course dealing with postflop play focuses on the small blind in single raised pots. 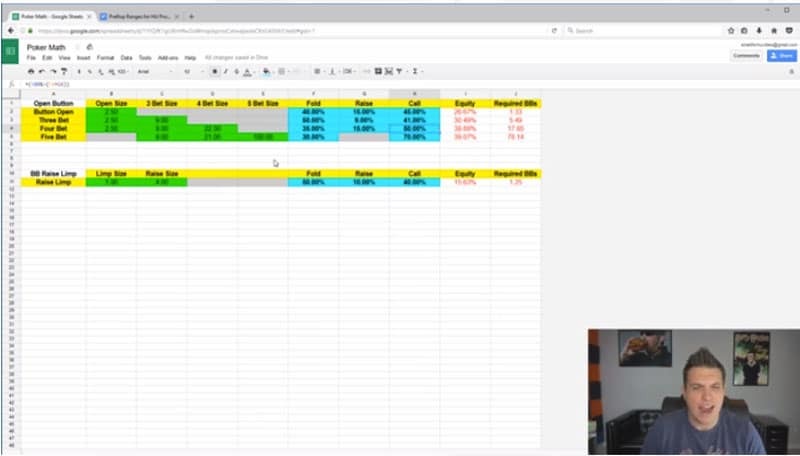 The segment begins with a video going through Doug’s database (instead of keeping it for the end like in previous parts) and looking into different important stats and win rates. In the video, Polk touches upon some interesting topics, such as the fact that tighter play might yield a higher win rate in general, but that doesn’t necessarily mean it is the best approach to the game, as you’ll be playing fewer hands. Following this video is the one that focuses specifically on the continuation bet from the small blind in RFI posts. Once again, he reaches after his game-tree and breaks down important things. An interesting aspect here is his ability to have a similar win-rate like his opponents while playing with a much looser overall range. 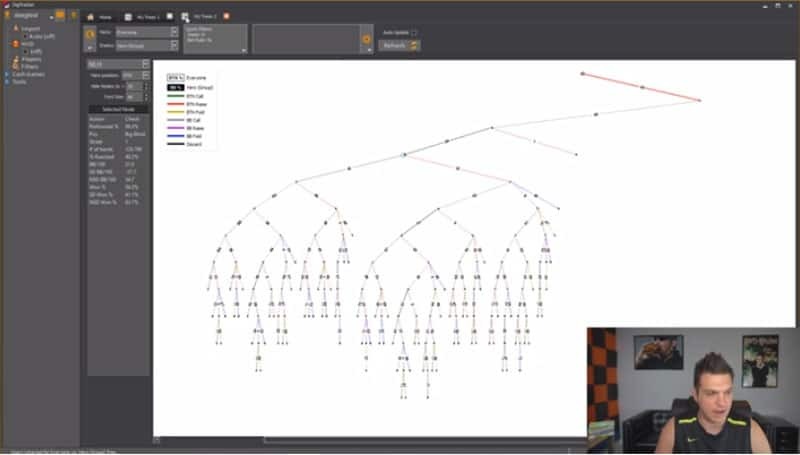 The complex tree branches into two parts (flop check and c-bet) and the video proceeds to explain the intricacies of both segments. For all of these, there are concrete examples of hands and explanations, so that we are presented with fully-encompassing and detailed explanations of these ideas. Of course, these are types of concepts that require thinking through and figuring out how to incorporate them in one’s own game but are definitely well worth the time and effort. Connecting to this video are two vids dealing with value and bluff combos. Doug tries to entice the viewer to think about hands in terms of different ranges and the number of possible combos in different spots. An important takeaway from this particular segment is how to balance your ranges in such a way that you achieve a situation where your opponents’ decisions are basically neutralized because you have just the right number of value and bluff combos in each and every spot. Once again, everything is nicely wrapped up with hand examples from the database, bringing the point home and clearly showing how all these various concepts have their place in actual, real-life situations at the poker table. From the small blind, the Advanced Heads-up Mastery Course naturally flows over to the big blind. Doug begins by talking about the general BB strategy and concepts, never failing to mention the disadvantage of being out of position and always keeping it in mind to figure out how to compensate for this disadvantage. An important thing discussed in this segment deals with continuation bets and how it is a good idea to lower your fold to c-bet percentage on the flop and how folding to turn bets is often the right approach. There are multiple reasons for this, as players tend to not bet as often with air on the turn and, also, we usually won’t get a chance to bet on the river after calling a turn bet, which takes away possibilities to win a hand. The rest of the vids is quite similar to the small blind segment, covering similar topics, but from a different perspective. However, Polk emphasizes that the big blind play is, in general, a bit more complex, so vids in this section are usually longer and a bit more in-depth because there is more ground to cover. It is important to understand what category a hand belongs to before you even start creating your game-plan. One topic that is not too common but might be of interest in this particular section also covers the leading strategy on the turn. Although this is a short video, it does present some interesting ideas to think about during the play and where you can apply them. However, there are some hands in this whole strategy that are better off as check calls, so including the lead strategy into your game-plan can be a bit tricky. 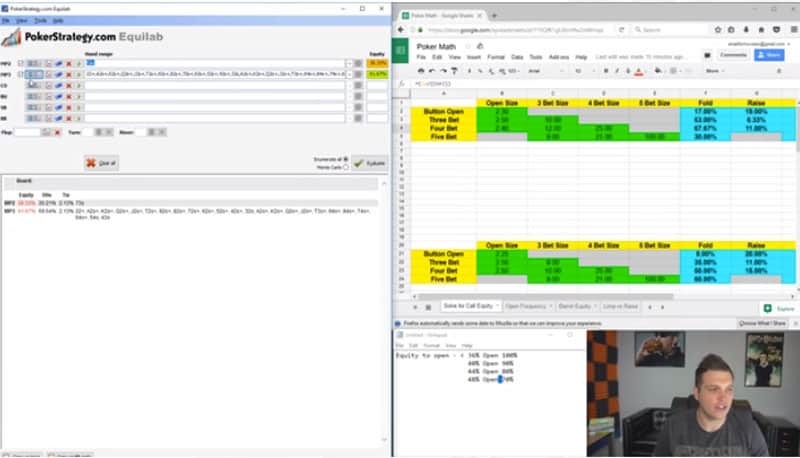 Doug discovers two particular situations where the small lead turned out to be the better approach than the check-call approach, and these results were derived from a large database of sample hands, so it is definitely an interesting thing to discover, even if it isn’t a huge part of the entire game. All in all, the Big Blind section is very long and in-depth and with all the different concepts covered, it stands to significantly improve your play from the big blind. It doesn’t just provide you with the tools to improve your big blind play but also offers insights into the way of thinking some of your opponents might use, which you can then include into your game-plan when they’re the ones playing from the BB. The final part of the SB play segment deals with concepts of probes and barrels. Polk goes at length to explain how we need to be calling enough probes from our opponents, making it impossible for them to probe with their weakest, no equity hands, and check with the strongest of holdings. An important idea he tries to get across here, followed by some of his own examples, is that if you allow this situation, you’re allowing your opponents to call you with pretty much any two cards from the big blind. Other videos wrapping things up talk about river raise after calling a turn probe, how to deal with a bet on the river in a checked pot, as well as various check-raise situations across the board. Like the rest of the lessons, these are also very elaborate and detailed, with a lot of math to back them up and many examples. The final section of the course deals with the play in 3-bet and 4-bet pots. Although these are important, these situations are usually not as complex due to smaller SRP. He looks at these situations from both perspectives, i.e. small and big blind, explaining how the big blind range is usually much stronger in these spots, while small blind aims to lose as little as possible. For the big blind, these are usually spots where they want to keep up the aggression. The small blind player has the position in these 3-bet pots but they also need to compensate for the generally weaker range. Polk once again goes through his hand samples, looking for spots to bring these points home. We’re presented with various groups of hands from different categories and he once again goes into details of his game-tree for situations when we’re 3-betting from the big blind and get called. The final video of the series, before moving on to the classic Play & Explain, present in pretty much all Upswing Courses, deals with 4-bet pots. These are broken into two parts, i.e. small blind and big blind situations, although the analysis isn’t as in-depth, in the light of what’s already been mentioned, i.e. due to lower SPRs, decisions in these spots tend to be more straightforward. Conclusion: Is Advanced Heads-up Mastery Worth Time and Money? In all the various poker courses out there, you’ll struggle to find the one that offers the same level of dedication and attention, regardless of the particular area of the game it covers. With his Advanced Heads-up Mastery Doug Polk really spills the proverbial beans, revealing some of his secrets to success and pretty much presenting us with his entire game-plan and approach to heads up. It is very uncommon for players to do this as most courses tend to offer bits and pieces but still hold back on some details. You just don’t get that feeling with Advanced Heads-up Mastery, as Doug methodically and patiently breaks down every segment of the game and shares his unique and hugely successful approach. All this being said, this particular course is the one that just won’t be worth it unless you’re ready to put in some serious work yourself. Just running through the videos and picking up a few ideas can help your game but if you want to really get to that next level, you’ll need to spend many hours dissecting your own and hands of your opponents, applying these newly discovered concepts and thinking about different spots and what you could have done differently. A nice thing about the whole course is the fact Polk is very forthcoming about this from the get-go. He even warns that many who decide to buy Advanced Heads-up Mastery might try this approach and he is very clear that this isn’t the way the course was envisioned. If you’re ready to work on your game, however, and really discover a whole different side of heads-up No-Limit Hold’em, this course will likely give you everything you need to succeed. Take your time with it, watch particular videos as many times as you feel necessary, but make sure you get to the bottom line of every covered concept and really understand it. Take the course the right way and results will follow almost without a fail!